February 14, 2019 /3BL Media/ - Freeport-McMoRan Morenci operations recently received the Arizona Voluntary Environmental Stewardship Program Award from the Arizona Department of Environmental Quality. The award recognizes companies that go above and beyond what is required by law from an environmental perspective. Morenci received a platinum status award for its effective recycling of high-density polyethylene. Also known as HDPE, this heavy, strong plastic material is used to make pipes and rolls of liner for constructing leach pads and containment facilities. 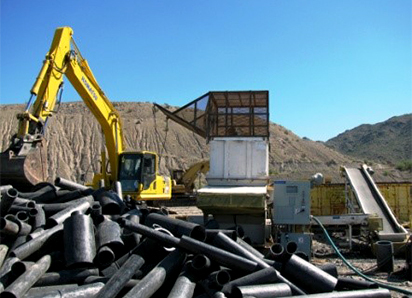 Since 2003, Morenci has been grinding, washing, drying, reforming and repurposing old plastic pipe into new HDPE pipe at the Morenci Plastic Recycling Facility. To learn more about Freeport-McMoRan’s materials stewardship programs, see fcx.com.